Delta Police Chief Nathan Hartsock and Fulton County Sheriff Roy Miller took the mic as guest DJs for last year’s Heart Radiothon. 2-3 p.m. - Kathy Huner, Mayor of Wauseon; Jeffrey Fryman, Mayor of Archbold; Kelly Carey, Fulton County Economic Development Corp.
8-9 p.m. - Greg Clapp, Fulton County Dairy Assn. Heart health in Fulton County one song at a time is the ultimate goal of the 45th Annual Heart Radiothon, on the air Thursday at WMTR-96.1 FM in Archbold. The locally-owned radio station will set aside its regular programming beginning at 6 a.m. and shift for the day into fundraiser mode to reach, and possibly surpass, a goal of $24,000. Until about 9 p.m., listeners can call in donations to hear their favorite contemporary song from practically any music genre or request team fight songs, golden oldies, odd novelty recordings, one-hit wonders, and just downright strange and silly selections. Favorites each year include “Who Let The Dogs Out,” by the Baha Men, as requested by the county dog pound; Johnny Paycheck’s “Take This Job and Shove It”; and disco queen Donna Summer’s hit, “Hard For The Money.” Jimmy Dean’s 1976 tear-jerker tribute to mothers, “I.O.U,” has been played each of the Radiothon’s 45 years of existence. The event’s credo – what recording the station doesn’t have it will find – has been stalwart. “Now with computers, we can get almost anything,” Radiothon board member Ron Murd said. The radio station is also eager to share recordings and live performances by local artists. In the past, Memories, a singing group from Pettisville, and Messengers Quartet, with members from around Fulton County, have been spotlighted. Over 30 guest DJs will spin the requests, and aren’t above singing to wish listeners a happy birthday, anniversary or other significant occasion. Donations collected for the 2018 Heart Radiothon totaled $24,187. Over 44 years the event has raised $953,207. Well into its fourth decade, the event has endured due to its transparency as an upstanding charity, said Maxell Smith Jr., WTMR owner. Proceeds from Heart Radiothon are used to fill requests for automated external defibrillators (AEDs) and replacement batteries for law enforcement agencies, fire departments, EMS squads, schools, churches, and other organizations. The Radiothon is responsible for the current placement of 141 AEDs throughout the county. Murd said over the years probably a half dozen or more lives have been saved in the county due to Radiothon-donated AEDs. They have included instances in the Village of Delta, at Sunny’s Campground, and at Archbold schools. “People hear the stories about the AED successes. They see the need for it,” Murd said. Listeners’ donations also cover the cost of cholesterol checks for the county’s high school freshmen and seniors, CPR equipment and supplies for EMS crews, heart-related program equipment for the Fulton County Health Center, heart-related programs at the Fulton County Senior Center, and heart-related equipment for Fairlawn Haven and Fulton Manor nursing homes, among other programs. Murd said while donations are typically between $5 and $100, no donation is too small or too large. 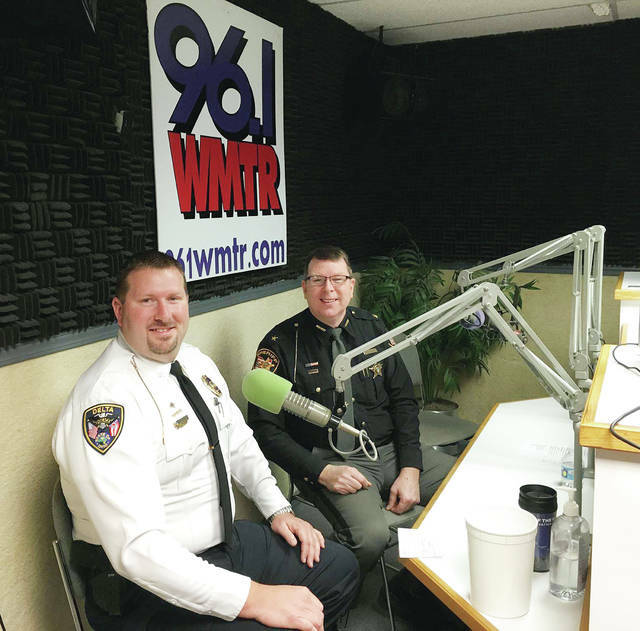 https://www.fcnews.org/wp-content/uploads/sites/45/2019/02/web1_heart-radiothon.jpgDelta Police Chief Nathan Hartsock and Fulton County Sheriff Roy Miller took the mic as guest DJs for last year’s Heart Radiothon. 2-3 p.m. – Kathy Huner, Mayor of Wauseon; Jeffrey Fryman, Mayor of Archbold; Kelly Carey, Fulton County Economic Development Corp.
8-9 p.m. – Greg Clapp, Fulton County Dairy Assn.